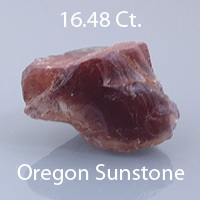 This sunstone was cut from the second and final half of the darkest red Oregon sunstone I’ve ever seen, and I used to live in Oregon and have looked through hundreds of kilos of sunstone rough. It has quite a bit of copper schiller in it, but I cut it to minimize the appearance of the schiller and maximize clarity, though it shows well from side angles. In person, people will likely assume this is a pigeon blood red Burma ruby. Video gives a better idea of what it looks like than the photo does. Comments: This sunstone was cut from the second and final half of the darkest red Oregon sunstone I've ever seen, and I used to live in Oregon and have looked through hundreds of kilos of sunstone rough. It has quite a bit of copper schiller in it, but I cut it to minimize the appearance of the schiller and maximize clarity, though it shows well from side angles. 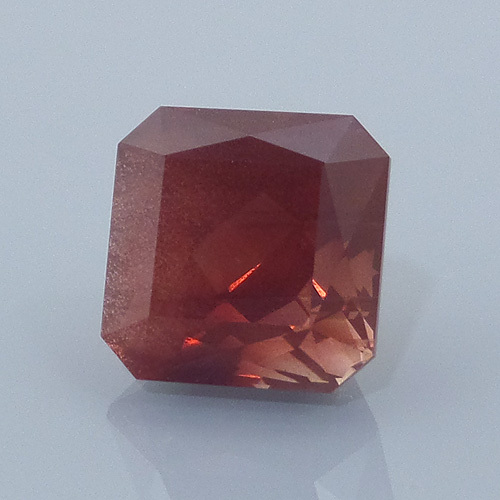 In person, people will likely assume this is a pigeon blood red Burma ruby. Video gives a better idea of what it looks like than the photo does.